In many interview situations you will not have a good location for filming. Sometimes the problem is location noise and other times you might not have enough space to setup all of your equipment. Setting up a greenscreen and using a virtual background can be a tempting solution to the problem. Before you decide to use a greenscreen on your next video interview, let’s take a quick look at the pros and cons involved so you can make an informed decision. Shooting on greenscreen and replacing your backgrounds in post production can give you a lot of freedom when planning your project. If the perfect location is too noisy or inconvenient, just take a series of stills or background videos and add them in later. Then, you can find a convenient location to shoot the interview. With the exception of high-end video cameras and DSLR cameras, most mid-price cameras and smartphone cameras tend to have the background in sharp focus. This is the opposite of the look we commonly associate with professional productions. Those tend to have softer focus on the background to draw attention to the subject. Using a virtual background lets you blur backgrounds to taste and create a very high-end look for your finished video. Virtual backgrounds also give you the freedom to be creative in editing. Why not place the photo or video someone is talking about in the background. You can create the impression of having shot interviews in multiple locations bay swapping out the background. Or, get artistic and change the color and tone of the background to match the mood of the story being told – sort of a mood ring on steroids. Flexibility and options are the key benefits of shooting on greenscreen. The cons of shooting interviews on greenscreen come down to two major issues. The first is quality and the second is time. 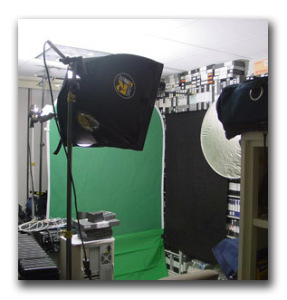 Creating a high quality result using green screens requires a higher level of planning and better equipment. The quality of post production tools for greenscreen work has improved tremendously in recent years, but you still need to do a decent job of lighting the screen and use a camera that captures enough image detail to create a natural looking image. The key to success here is testing. Work out the entire process from beginning to end and try it before using it with an actual interview subject. Another quality issue that needs consideration is planning your lighting. If the lighting of your subject doesn’t match the lighting in the background, the resulting video will be unsatisfying. If this balance is really bad, the video will look cheap and amateurish. So, plan ahead and make notes. The second con is that virtual backgrounds add an extra step to the post production process which requires more time. The editing system will take a little extra time stitching everything together when you export the video. You will spend time tweaking settings and color correcting to get the composited shots to look right. And, because you have options for what appears in the background, you will spend extra time making decisions in the editing room (and clients love to change their minds when they know they can.) Be prepared for a significantly longer post production process. Choosing to use virtual backgrounds will always be a judgement call. You will have to weight the pros and cons and determine whether shooting on greenscreen makes sense. For personal projects, make sure the extra work won’t slow you down to the point where you lose interest in the project and never finish. For professional projects, make sure you budget for the extra time so you don’t lose money on the project. Copyright © 2019 Reel Histories™.